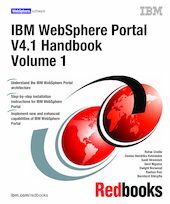 The IBM WebSphere Portal V4.1 Handbook is available in three volumes of Redbooks. This is volume 1. These Redbooks position the IBM WebSphere Portal for Multiplatforms as a solution that provides a single point of interaction with dynamic information, applications, processes and people to help build successful business-to-employee (B2E), business-to-business (B2B), and business-to-consumer (B2C) portals. In the three volumes of the IBM WebSphere Portal V4.1 Handbook, we cover WebSphere Portal Enable and Extend. The IBM WebSphere Portal V4.1 Handbook will help you to understand the WebSphere Portal architecture, how to install and configure WebSphere Portal, how to administer portal pages using WebSphere Portal; it will also discuss the development of WebSphere Portal portlets and how to use specific WebSphere Portal applications. In this IBM Redbooks publication, we discuss the installation of WebSphere Portal within the Windows 2000, Linux and AIX environments. In addition, we discuss the automated installation of WebSphere Portal using Setup Manager and manual installations.